Armenian Alphabet - 39 coins issued by the Central Bank of Armenia. Silver coins were issued in 2 types: proof and brilliant uncirculated. Proof mintage - 200 pcs each type. BU mintage depends on letter (Ա, Մ, Ս, Ր, Ն, Ի, Վ, Հ, Ե, Լ, Գ, Ո, Է, Զ, ՈՒ, Կ, Բ, Ռ, Շ, Թ, Տ) 8000 pcs. and (Յ, Պ, Դ, Ջ, Փ, Օ, Ք, Խ, Ժ, Ղ, Ֆ,Ծ, Ց, և, Ը, Չ, Ձ, Ճ) 2000 pcs. 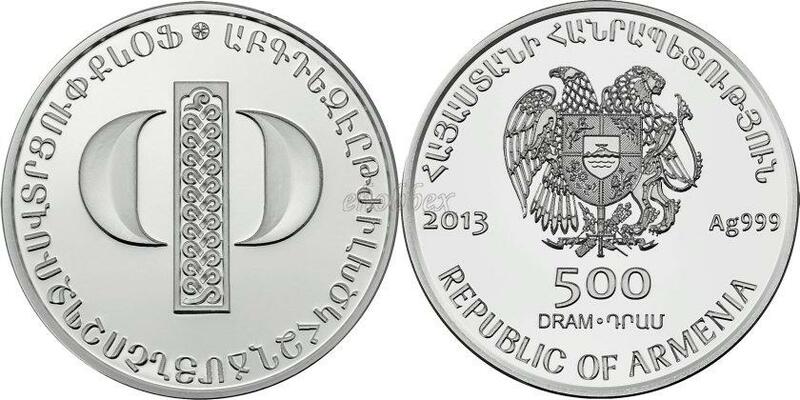 In the center of the coin coat of arms of the Republic of Armenia, below inscription "5000 Dram" (in Armenian and English) Around the coin inscriptions: "Republic of Armenia" (in Armenian and English), "2013" and the hallmark "Ag 999". In the center of the each coin a letter from Armenian alphabet. Around the coin all Armenian letters.